Moles are very common and wide spread across Britain and although they are rarely seen due to the fact they live most of their lives underground in tunnels they can become a very awkward pest to remove form a garden or landscaped area. Moles have evolved to be highly adapted for their underground tunnelling way of life. 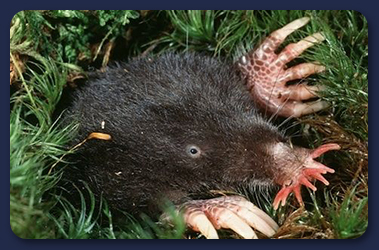 A mole can dig its way through an astonishing 14 metres of earth within just one hour. Moles feed, sleep and breed in their tunnels. They occasionally appear above ground level at the top of one of their characteristic molehills, and even then usually only the head and pink fleshy star shaped snout is visible. On lawns and landscaped areas, the area disfigured by the molehill stops the grass from growing and will allow weeds to grow more freely. Where they have been digging beneath agricultural land it can stunt the growth of the crop or even destroy it. Not known as prolific breeders, female moles generally give birth to one litter per year containing 3 – 8 youngsters. They have a gestation period of around 4 weeks. The young leave their mother when they are around 5 weeks old and have an average life span of 2 and a half years. Various repellent devices can be used but these have varying degrees of success when eradicating a Mole problem. Mole traps are a more common method of Mole removal but they are very specialist and must be used correctly to be effective. Poisons are another alternative that must be implemented by a professional as strict legislations are in force and specialist licenses are required to use these poisons.